In a study published last week in PLOS One, researchers have reported that pigeons – or Columba livia as they are known scientifically – are able to distinguish between healthy and cancerous tissues in microscope slides and X-rays with an accuracy rate of up to 99%. According to lead author Richard Levenson, professor of pathology at University of California, Davis, the birds “share many visual system properties with humans”. He and his co-authors addressed several key questions including: (1) Could pigeons be taught to discriminate between benign and malignant features? (2) How would they perform when presented with new images? and (3) Could the birds’ skills have any practical application? 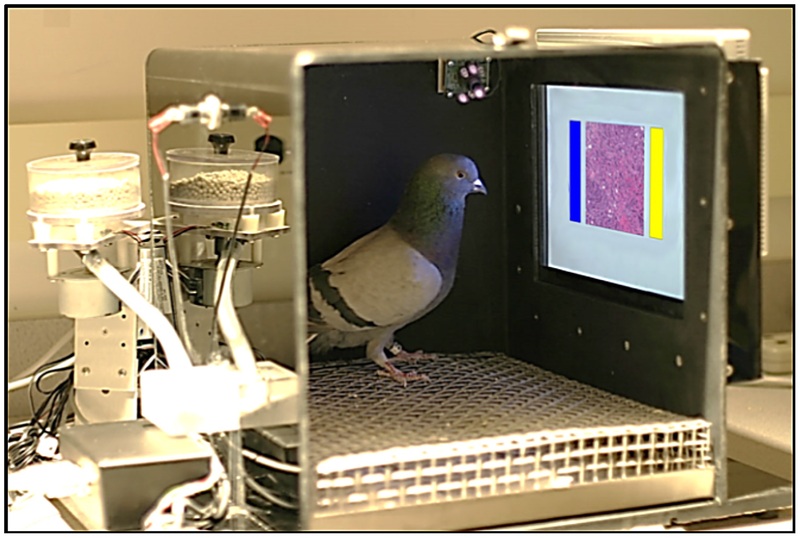 In the first experiment eight pigeons were presented with 144 microscope slides of breast tissue, with and without colour, at different levels of magnification. The birds were then able to peck either a yellow or blue button to indicate whether the image was healthy or cancerous (see image above right). If the choice was correct, the bird was rewarded with food; however, if the choice was incorrect, the image was repeatedly presented until the bird chose correctly. After two weeks of training, the pigeons’ accuracy rate had increased from 50% to 85%. Then, when novel images were presented to the birds, they correctly identified the images 85% of the time, demonstrating an ability to generalize what they had learned. Interestingly, using a technique termed “flock sourcing” – where the pigeons’ responses were combined – the accuracy rate increased to 99%. In the second experiment four new birds were tested using X-ray images of breast tissue to see whether they could identify micro-calcifications, calcium deposits that are often linked to breast cancer. Again the pigeons were successful: after two weeks of training their accuracy rate improved from 50% to more than 85%. In the third and final experiment, four birds were given a more challenging task: the identification of masses in mammograms (see image below). While they performed reasonably well on the training images, they were unable to identify masses as benign or malignant in novel images. When viewing the same set of mammograms, a panel of trained radiologists had an accuracy rate of 80%. So, is this a bird-brained idea? Could breast cancer diagnosis be designed around giant farms of birds pecking away at images? Levenson doubts this scenario, suggesting that computers will get there first. However, he believes that in the future pigeons could help scientists and engineers evaluate new medical imaging techniques, thus contributing to innovation.